Episode21 of Inside BU Hockey features Bernie Corbett’s interviews with Head Coach David Quinn, sophomore forward Ryan Cloonan and former Terrier standout Danny O’Regan. Cloonan, a speedy forward from East Longmeadow, Massachusetts, scored 65 points for the Boston Junior Bruins before heading to Commonwealth Ave. Last season he scored 14 points and was named a Hockey East Top Performer three times. He has five points this season. Currently playing for the AHL San Jose Barracuda, O’Regan has 50 points and is the league’s top-scoring rookie. He made his NHL debut earlier this season and scored his first NHL goal. Coach Quinn says Bobo Carpenter and John MacLeod will return from injury tmrw vs. BC, Jake Oettinger to start. Full preview for tomorrow. 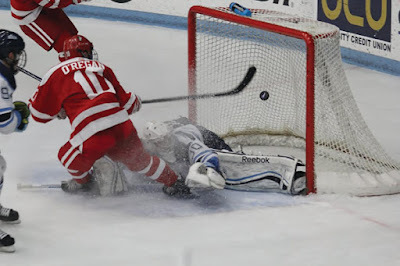 ►SB Nation’s Hockey East All-Rookie team includes Clayton Keller and Jake Oettinger. 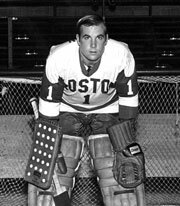 Turn Back Thursday: Forty-five year ago tonight, top seed BU defeated Wisconsin, 4-1, in the NCAA semifinals and punched its ticket to the title game against Cornell. The Badgers took an early lead on a fluke 65-foot shot, but goalie Tim Regan slammed the door the rest of the way, making 26 saves. Paul Giandomenico scored the second-period equalizer and then captain John Danby scored a natural hat trick to put Wisconsin away.